If you're in the mood for an Apocalyptic Alien Invasions story then this is the book for you. 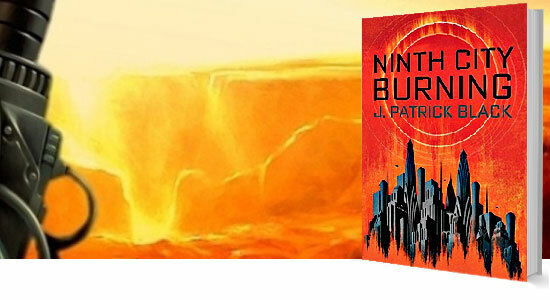 This debut novel by J. Patrick Black, is brought to life by the many narrators of the book, each one represents a different part of the society of Ninth City. Seanan McGuire, author of Magic for Nothing, says that "Ninth City Burning is simultaneously an epic fantasy, a science fiction adventure, a coming of age story, and a delight." Fans of Ender, Harry Potter, Starship Troopers, and manga-style armored mobile suits will find Black’s debut the perfect ticket to a fantastic new world…This thrilling kickoff to an action-packed series will appeal to those who enjoy science fiction mixed with fantasy. Have you read it yet? If so catch up with me on Twitter or Facebook and let me know what you thought.